Family and twin studies suggest significant genetic and environmental contributions to the development of SP (Social Phobia). First-degree relatives of patients with SP have increased rates of SR (Fyer et al. 1993), but this familiality may be limited to patients with the generalized subtype (Stein et al. 1998a). Kendler et al. (1992) reported, on the basis of data from 2,163 directly interviewed female twins, that 30%-40% of SP is heritable. A follow-up study, reinterviewing 1,708 of the original cohort, resulted in an estimate of a 51% genetic contribution (Kendler et al. 1999). A. smaller study showed no increase in rates of SP between monozygotic twins (Skre et al. 1993). Patients with SP experience signs of autonomic arousal when in social settings. This observation ted to the hypothesis that patients with SP may have an overactive autonomic nervous system. Levin et al. (1993) examined the heart rate and blood pressure response to a public speaking task of patients with SP and control subjects. Surprisingly, patients with generalized SE did not differ from control subjects in these physiological parameters. Further studies have confirmed these findings (Naftolowitz et at. 1994) and have suggested that only SP limited to performance anxiety may be associated with increased autonomic reactivity. Dopaminergic transmission has been postulated to play a role in SP. Patients with SP appear to show a preferential response to monoamine oxidase inhibitors (MAOIs), which have dopaminergic activity, and lower levels of dopamine metabolites in the cerebrospinal fluid have been associated with introversion. Recent functional brain imaging studies have found decreased striatal dopamine D2 receptor and dopamine transporter binding in patients with SP (Schneier and Akieri 2003). Dopamine circuits mediating social reward have been postulated to be dysfunctional in SP. Differences have been shown in several other brain systems in patients with SE Neurohormonal studies have found some evidence for serotonin and growth hormone abnormalities. Functional magnetic resonance imaging studies of amygdala function have suggested that a sensitivity to fear conditioning may be present in SP (Argyropoulos et al. 2001). Because SP involves fears of negative evaluation and embarrassment in social situations, it is not surprising that psychosocial aspects of childhood and adolescence play a significant role in the pathogenesis of this disorder. Empirical research has suggested that modeling, restricted exposure to social situations, the nature of the family environment, and peer relations may be influential in the development of SE (Roth et at., in press). Individuals learn how to relate to their social environment largely through their parents or caretakers. Thus, the fears experienced by individuals with SP may arise, in part, from modeling their parents' social behavior. Individuals with SR often grow up with parents who have strong social-evaluative concerns, placing great importance on making a good impression with others (Bruch etal. 1989; Caster etal. 1999). This emphasis may encourage children to overestimate the standards expected by others or the negative consequences of not meeting thesc standards, leading to increased expectation of threat in social situations (Bruch et al. 1989; Buss 1980; Cloitre and Shear 1995). Parents may also model their own social anxiety to their children, further communicating to them that the social world is a dangerous place and promoting the belief that the social environment should be feared. This may lead children to be more likely to notice social threat in their environment and promote the avoidance of social situations. Parental social behaviors that restrict children's exposure to rewarding social relations may also encourage thc development of SP. Parents who are restricted in their own social relations and/or do not foster social activities in which their children may interact with others facilitate social avoidance and prevent the extinction of naturally occurring social fears in their children (Bruch et al. 1989). As a result, the children may have less opportunity to develop the interpersonal skills necessary for rewarding social relationships and may be more likely than other children to view interactions with peers as punishing rather than pleasurable. In addition, childhood exposure to parenting styles that are overprotective (e.g., Lieb et al. 2000), involve little display of affection toward the child (e.g., Arrindell et al. 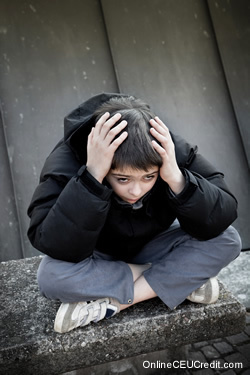 1989), and use shame as a method of discipline (Bruch and Heimberg 1994) is frequently reported among adolescents and adults with SR Excessive parental control may inadvertently convey to children that they are inept, whereas decreased levels of parental affection and the use of shame may increase perceptions that other people are critical and that negative evaluation is a likely outcome of social situations. This perception also may have been developed and/or reinforced through peer relations, especially as children grow older and spend more time with peers than family members. Interpersonal experiences with peers may serve to exacerbate and maintain symptoms of social anxiety; however, this relationship seems to be reciprocal. On the one hand, passive and withdrawn children are more likely to be rejected by their peers, which may contribute to the development of a belief that they cannot succeed in the social world, resulting in increased social avoidance behavior (Rubin and Mills 1988). On the other hand, socially anxious children are more likely than nonanxious children to experience negative peer relations, and these experiences, most notably peer neglect (La Greca et al. 1988; Strauss et at. 1988), may contribute to the maintenance of social anxiety Adults with SP also report having been teased and bullied during childhood, suggesting that these difficulties with peers can continue to have an impact into adulthood (McCabe et al. 2000; Roth et al. 2002). Although we have focused here on family environment and peer relations in the development and maintenance of SP, the underlying theme is the perception that the social world is a harsh and critical place. The prominent fear of negative evaluation in SP may have arisen from parenting practices or social experiences that directly or indirectly promote this belief, coupled with the facilitation of social avoidance strategies that reduce the likelihood of rewarding relationships that could alter this perception. In fact, socially anxious people demonstrate a number of beliefs of this nature, including the belief that others are highly critical (Leary et al. 1988), that others hold high but often unarticulated standards for their performance (Alden and Wallace 1991), and that social success leads only to higher expectations for performance in the future (Wallace and Alden 1997). - Stein, Dan J., Clinical Manual of Anxiety Disorders, American Psychiatric Publishing: London, 2004. The preceding section contained information about the pathogenesis of social phobia.Write three case study examples regarding how you might use the content of this section in your practice. Patients with SP experience signs of what when in social settings? Record the letter of the correct answer the CEU Answer Booklet.